2011 TSSAA AAA STATE CHAMPIONS! The Official Sponsor of Lady Warrior Basketball! The Lady Warriors will be playing in the Iolani Classic in Honolulu, Hawaii December 9-12, 2010! The Lady Warriors will then fly to Phoenix, AZ to play in the Nike Tournament of Champions December 16 through December 21, 2010! THE LADY WARRIORS EXCEL IN THE CLASSROOM TOO!!!! The Lady Warrior's Team GPA for the 2009-2010 Season was 3.4478! Ten players (out of 13 total varsity players) had above a 3.000 GPA, six players had above a 3.500 GPA and two players had above a 4.00 GPA (Finesse James & Darianne Butler). Nine Lady Warriors took honors-level courses! 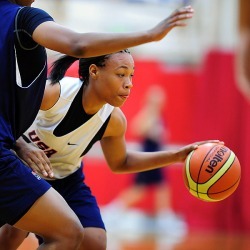 Congratulations to sophomore Danielle Ballard for being invited to try out for the USA Basketball Under 17 team. Danielle will be in Colorado Spring, Colorado June 8-15, 2010. Good Luck Danielle!!!!! Sophomores Danielle Ballard and Alliyah Whiteside, along with Freshmen sensation Nina Davis were named to the 2010 ESPN Rise Underclass All-American Team! Congratulations Ladies!! We are so proud of you!! To read the complete list, click on the link below. Congratulations to the Lady Warriors for making it to the 2010 Tennessee State AAA Semifinals! Freshmen Nina Davis and sophomore Danielle Ballard were both named to the All-Tournament Team. Congratulations to the Lady Warriors for winning their second straight Region 8 Championship! Congratulations to Aaliyah Whiteside, Nina Davis, and Jalen O'Bannon for making the Region 8 All-Tournament Team!!!! Congratulations to Danielle Ballard for being named Region 8 Tournament Most Outstanding Player! Great job ladies! Keep up the good work! CONGRATULATIONS TO THE LADY WARRIORS FOR WINNING THEIR THIRD STRAIGHT DISTRICT TOURNAMENT CHAMPIONSHIP! JALEN O'BANNON, NINA DAVIS AND DANIELLE BALLARD WERE NAMED TO THE 16 AAA ALL-TOURNAMENT TEAM. AALIYAH WHITESIDE WAS NAME 16 AAA DISTRICT TOURNAMENT MVP! CONGRATULATIONS TO DANIELLE BALLARD FOR EARNING MVP HONORS IN THE CITY CHAMPIONSHIP GAME! CONGRATULATIONS TO DANIELLE BALLARD FOR MAKING THE NIKE TOURNAMENT OF CHAMPIONS JOE SMITH ALL-TOURNAMENT TEAM! The Lady Warriors beat Bishop O'Dowd last night 67-53 behind Junior, Aaliyah Whiteside's, career high 37 points. The Lady Warriors played most of the game without starting point guard, Nina Davis, who was a bit under the weather. Freshman, Jasmine Cincore, was also missing from the rotation after chipping a bone in her right big toe while in Hawaii. Juniors, Danielle Ballard and Jalen O'Bannon, scored 15 points and 10 points respectively. Freshman point guard, Marisa Knox, gave the Lady Warriors great minutes off the bench and along with Meme Hill, Yasmeen Brady, and Kahdeja Howell, applied great pressure defense on Bishop O'Dowd's point guard and leader of the team. The Lady Warriors get a much needed day off today before playing Long Beach Poly on Monday at 3:30 MST. A win Monday will put the Lady Warriors in the semifinals of the Joe Smith Division of the TOC at 5:00 pm Tuesday against the winner of #1 Mater Dei (CA) and Monarch (CO). Click the Watch Live link above to watch the Lady Warriors' game against Bishop O'Dowd. The Lady Warriors are still in Hawaii preparing to play in the 2010 Nike Tournament of Champions in Phoenix, Arizona December 18-22, 2010. To see the tournament brackets, click here. The Lady Warriors, now 6-2, open play in the TOC against Bishop O'Dowd out of Oakland, California Saturday, December 18th at 2:00pm MST (3:00pm CST). Please click the Watch Now link above to see the games. The games will be uploaded each night for viewing. Low today 69 degrees. High today 81 degrees. Hawaiian temperature! Low today 18 degrees. High today 32 degrees. Memphis, TN tempertaure! The Lady Warriors are taking a much needed break today to enjoy the beautiful temperatures of Honolulu, Hawaii. The Lady Warriors went 2-1 in the Iolani Classic beating Tsinghua High School (65-30) in the first round and Archbishop Mitty (55-52) in the semifinals before losing to #2 Brea Olinda in the championship (74-58). The Lady Warriors will layover in Honolulu until Friday, December 17th as they prepare to play in the Nike Tournament of Champions in Phoenix, Arizona for the third straight year. They will open the TOC against Bishop O'Dowd (CA) on Saturday at 2:00pm (MST) or 3:00pm CST. The game against Tsinghua and Brea Olinda should be available to watch by tomorrow at the latest. The Lady Warriors opened play in the 25th Annual Iolani Classic with a huge 65-30 win over Tsinghua High School out of Beijing, China. Tsinghua, ranked 5th in China, could not handle the Lady Warriors full court defense and athleticism as the Lady Warriors forced them into numerous turnovers that led to easy baskets. The Lady Warriors led 24-4 at the end of the first quarter and 42-12 at the end of the first half. Junior Danielle Ballard paced the Lady Warriors with 20 points, all of which came in the first half of play, and started with a 3-point shot to open the game. Junior Aaliyah Whiteside added 14 points while sophomore Nina Davis added 10 points. Senior Darianne Butler chipped in 2 points, junior Jalen O'Bannon scored 8 points, freshmen Yasmeen Brady scored 4 points, freshmen Marisa Knox scored 3 points, freshmen Tia Wooten scored 2 points, and freshmen Jasmine Cincore scored 2 points as well. Click here to read the article on the game by memphisrivals.com. The Lady Warriors play Archbishop Mitty, out of San Jose, California, tonight at midnight (Memphis, TN time and 8:00pm Honolulu time). A win tonight will move the Lady Warriors into the championship game Saturday night against the winner of the Brea Olinda (CA)/Konawaena (HI). Last night's game should be available to watch latter this evening. Click the the Watch Live link above to watch all of the Lady Warrior basketball games. Keep up with the Lady Warriors on Twitter. Search coachnikibray for the latest Lady Warrior updates! The Lady Warriors officially open their season up tonight against Bolingbrook High School (Illionis), ranked #4 by ESPN Hoopgurlz at 9:15 tonight at home in the 2nd Annual Turkey Jamm. This year's Turkey Jamm boasts four top ten teams in the nation: Bolingbrook (#4), Memphis Central (#5), Potter's House (#6), and Whitney Young (#9). Click here for the article by the commercial appeal. Congratulations are in order for freshmen Jasmine Cincore for being named the 2010 MIAA Jamboree Player of the Game in last night's win over BTW. Congratulations Jasmine!!!! If you cannot make it to see the Lady Warriors play tonight at Houston High School, click the Watch Live link above to watch the game live or if you want to watch the game again! Please click here to see the schedule for the Houston High School Hall of Fame. Parents, please make sure that you have registered your child for the River City Girls Basketball NCAA-Certified College Exposure Event by clicking on the link to the left. Also, pre-season conditioning begins Tuesday, September 07, 2010. Your child must have a physical, their $15 for their insurance, and their list of 25 Loved Ones by September 07, 2010. Plan to pick your child up at 5:00pm on Tuesday, September 07, 2010. We will begin to stay until 6:00pm each day the second week of conditioning. Also, please remember to work on helping us secure campers for our Fall Basketball Camp on Saturday, September 18, 2010. Make sure the campers you secure select your child's name under the Referred By drop box so that you get credit for that camper. Thanks so much for being the greatest parents! support of Lady Warrior Basketball. We will have our initial team meeting this Thursday from 2:30-3:30 in room PE II. The first parent meeting will be Tuesday, August 24, 2010 from 6:00 - 7:30pm. I will update this section of the website frequently, almost daily for most of the year so please check back often. There is a ton of information to communicate to parents and players and the team website will be one of the main sources of communication. Also, please make sure that Coach Bray has your email address (both players and parents) because I will also send information via email. Thanks so much for all of your support and let's have a great season and school year! The Lady Warriors are in Phoenix, AZ playing in the Nike Tournament of Champions. The Lady Warriors beat H.D. Woodson (Washington, D.C.) 69-40 on Friday in the first round of the tournament. Sophomore, Aaliyah Whiteside, led all scores with 18 points, 1 rebound, and 4 assists. Sophomore, Danielle Ballard scored 14 points, grabbed 8 rebounds, 3 assists, and 10 steals. Senior Finesse James scored 11 points, had 1 rebound, and 2 steals. Junior Darianne Butler added 7 points, 8 rebounds and 1 steal. Sophomore, Jalen O'Bannon, had 6 points, 7 rebounds, and 2 steals. Freshman, Nina Davis, has 5 points, 3 rebounds, 3 assists, and 4 steals. Rehunna Gillespie chipped in 4 points and 2 rebounds while Jessica Bradley and Michella Carter scored 2 points apiece. The Lady Warriors out rebounded H.D. Woodson 32-22 and forced Woodson into 28 turnovers. Memphis Central played #1 in the Nation, St. Mary's (Stockton, CA) on Saturday and lost a heart-breaker by 3 points (76-73). Freshmen, Nina Davis, led the Lady Warriors with 24 points, 8 rebounds, and 1 assist. Sophomore, Danielle Ballard, completely took over the game as she scored 16 points, grabbed 16 rebounds (career high), 8 assists, and 3 steals. Senior, Finesse James, hit 5 three-point shots to score 15 points and 1 steal. Sophomore, Aaliyah Whiteside, scored 12 points, 4 rebounds, and 1 steal while fighting congestion and a sinus headache. Junior, Darianne Butler, added 6 points, 1 rebound, and 1 steal while sophomore, Jalen O'Bannon, grabbed 8 rebounds, 1 assist, and 4 steals. The Lady Warriors out-rebounded the #1 team in the nation 38-26. St. Mary's has two players who have signed major Division I scholarships, Afure Jemerigbe signed with Cal Berkeley and Chelsea Gray signed with Duke University. The Lady Warriors play Monday, December 21st at 12:00pm CST against Mt. Lebanon (PA) at Hamilton High School. Watch the game live right here by clicking the WATCH LIVE link to the left. GO LADY WARRIORS GO!!!! The Lady Warriors are gearing up to travel to Phoenix, AZ on Thursday for the Nike Tournament of Champions! Central will play H.D. Woodson from D.C. on Friday at 6:00pm CST. Watch the game live right here on our new website ladywarriorbasketball.net with Venson Hawkins and Peter Sync on the Hawk & Pete Show. The Lady Warriors advance to 5-1 with big wins over the past weekend against Trezevant High School and West Memphis High School in the Blue Devil Classic. The Lady Warriors improve to 3-1 after wins over Bolton High School and Riverdale (Murfreesboro, TN) over the weekend. Central plays Trezevant on Friday night at 4:00pm and West Memphis on Saturday night at 7:00pm at West Memphis in the Blue Devil Classic. The Lady Warriors and other local teams recieve national media attention on ESPN after participating in the First Annual Tennessee Turkey Jamm. Click the link below to read the article. 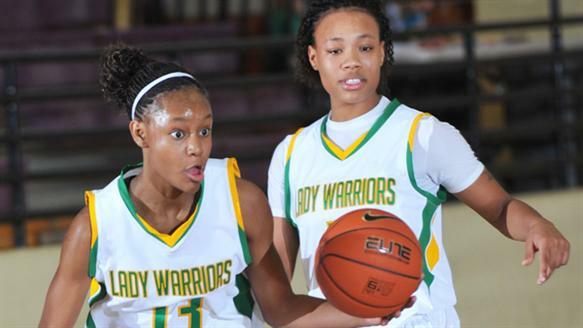 Central's own Aaliyah Whiteside and Nina Davis featured in ESPN article!! Although the Lady Warriors (#9 in the nation) lose on Friday night to #19 Riverdale Baptist (Upper Marlboro, Maryland)by 14 points, Memphis Central bounces back with a huge win over #6 Potter's House out of Jacksonville, Florida. The Lady Warriors opened the 2009-2010 season with a victory over the Lady Wolverines of Overton High School last night in the MIAA Jamboree. Central welcomes another amazing freshmen in Nina Davis, who was named the MIAA Player of the Game in her Lady Warrior debut. Overton chose to play without their key players, including senior Jasmine Robinson. Aaliyah Whiteside and Danielle Ballard played outstanding and led the Lady Warriors to an easy victory. Junior, Darianne Butler, and sophomore Jalen O'Bannon, had outstanding showings in their debuts into the starting line up. Every Lady Warrior dressed saw quality minutes as Central displayed the potenial for a deep bench. The Lady Warriors open the 2009-2010 season on Friday, November 27th, hosting the 1st Annual Tennessee Turkey Jamm, which includes top teams in the nation. The Lady Warriors open with ESPN #19 Riverdale Baptist out of Maryland on Friday night at 8:00pm and ESPN #6 Potter's House out of Jacksonville, FL on Saturday night at 8:00pm. Click on the link below to see the full lineup. Catch all of the Lady Warrior basketball games live on this site. Click the Watch Live link above. Our schedule is finally complete!!!! Click on the link below to download a copy now! Parents....our next Booster Club meeting is Thursday, September 10, 2009 at 6:00pm. We really need as many parents as possible to attend. Preseason begins Tuesday, September 8th from 2:30-6:00pm. We will work out on Mondays, Tuesdays, and Thursdays until October, then we will work out five days a week. It's time!!!! Camp time that is! We leave at 7:30am tomorrow morning (Sunday, June 14th) for MTSU camp. Please plan to arrive at Central in the Bellevue lot at 7:00am. We hope to be loaded up and ready to pull out by 7:30am at the very latest. We will be back Tuesday night, hopefully before 6pm! When we are coming through Jackson, TN we will ask all of the kids to give their parents a call. Please try to be there waiting for your child. We will be rushing to get the vans turned in on time so we do not have to pay for another night. Please make sure your child has money for food. We will do the McDonald's, Burger King, etc. so as to keep expenses low. I also have the information for the University of Memphis camp. I need everyone's $50 by Thursday's practice as well as the waiver form signed by a parent. Click here to download the waiver form. Please bring that to practice on Thursday. I am also posting the Nerves of Steel bracket (click here) as well as the pool play bracket. I need all players at the Elma Roane Fieldhouse at the University of Memphis Friday by 11:00 am. Please eat lunch before you come and bring money to eat dinner on campus....there is a Subway etc. on campus. Parents are welcome to come watch any and all games. I will let everyone know on Friday what time I need you there. Also, the young team will be playing a few games as well, but they are not posted yet. Click here for the pool play schedule. Thanks as always for allowing me the opportunity to coach your children! I am very thankful for the opportunity!!! The Lady Warriors will be leaving for MTSU camp this Sunday, June 14th. Players need to arrive at the school in the Bellevue Blvd lot between 7:00 am and 7:15 am to load up. Click here for a list of items each player should bring for camp. We will be traveling in mini-vans and we will have a U-Haul for our luggage. Players need to bring their own food money! We will be back Tuesday, June 16th around 6-8 pm. Parents...we will ask your child to call you when we are in Jackson, TN. Please be at the school waiting on us....coaches get little to no sleep at camp and we will be ready to get home and rest. We will be off on Wednesday, June 17th, but will have workouts on Thursday, June 18th. We will attend the University of Memphis camp on Friday, June 19th, and Saturday, June 20th. Players need to pay their camp money by practice tomorrow if they have not already done so. Thanks!!!! Summer workouts are here! I will be at the school working tomorrow from 1-3pm. The gym will be open for free play and individual work. There will not be any form of practice tomorrow. We will workout on next Tuesday from 1-3pm. I will open the gym around 11:30am and set the gun up if anyone wants to come in and get some shots up. I need for everyone to either text me or call me tonight to let me know if they will be able to go to team camp. Hopefully I will be able to post that information on our website tomorrow. If we cannot go to camp....we will just work on getting better at home. Everything always works out for the best if you will let it. The kids had a great workout today and hopefully we can keep that up! Everyone must put in time on their own. It doesn't have to be a lot of time....it must be quality time. If everyone worked on ball handling just 15-20 minutes 4-5 days a week.....we would see a great improvement in our ball handling. So please commit just a little focused time most days of the week and over time you will see tremendous improvement. Again, the gym will be open for free play tomorrow from 1-3pm. It is totaly optional and unorganized. You can play pick-up or just work on your game. Our next scheduled workout is next Tuesday. Remeber that hard work pays off.....but you cannot be at your best if you do not rest. Listen to your own body and make good decisions!!!! Lastly.....I still have a few kids with candy money out! PLEASE! PLEASE! PLEASE! Get your money turned in by next week! You can turn in any boxes of candy that you have not opened! I need them when you come to workout on Tuesday!! Thank you! You guys did a GREAT job today!!!! Ladies, please make sure you have turned in ALL your candy money by this Thursday, May 21, 2009. I do not expect any candy returned....just the money. Anyone who does not turn in their money will be placed on the debt list and will not be allowed to receive their report card until the debt has been cleared. Also, summer workouts for camp begin next week. We will practice from 2-4 on Tuesday, May 26 and Thursday, May 28th. If you plan to go to camp you must attend workouts. Parents, please remember that we are having a parent meeting with Mr. McCullough tomorrow, Thursday, May 14, 2009 at 6:00 pm. Please try your best to make it to this meeting. Thank you so much for all that you do and all the time you sacrifice for our program and your child. Thanks again and PLEASE try to make it to the meeting. The Lady Warriors will be regonized for their amazing season at City Hall today at 3:30 pm. Congratulations Ladies!!!! ESPN's Kelvin Powell wrote a nice piece on freshman sensation, Aaliyah Whiteside, after attending the Nike Skills Academy in Atlanta, GA last month. Click here to read that article. Great job AW!!!! Keep up the hard work! IT WILL PAY OFF!!! Check out the "CALENDAR" link on the left side of the page. I will update that with new dates as they come available. We have a proposed conference schedule up....it is not set in stone yet! We are still waiting to hear back from the MIAA on its acceptance. Wow! Time is flying by....and so much is happening with our program. Dr. Cash, Memphis City Schools superintendent, is recognizing and honoring the Lady Warriors Monday night (April 20, 2009) during the school board meeting. Every member of our team, including managers, needs to be at the BOE by 5:00pm. Every young lady needs to be dressed in a black dress and every young man needs to be in a black suit or black pants with a white shirt and tie. Please make sure you are there and on time. This is a very important opportunity for our program and it should be treated as such - no talking, laughing, goofing off from the time you walk in till the time you leave. Please invite your parents, family members, and friends to attend. I am not sure how long we will be expected to stay, but as soon as I find out, I will let you know. Under Armour flew in from Baltimore, MD yesterday to visit with our players and staff. They were very impressed with our program and we are excited to hear back from them soon. We are one of only seven girl's high school basketball teams in the entire country they are considering sponsoring. Doing things right and being patient really do pay off in due time. I will keep everyone abreast of new developments. We are having our spring parent meeting Tuesday, April 21st at 7:00pm in the school cafeteria. This meeting is for returning players and anyone who is considering attending Central High School next year. We will be discussing spring and summer workouts (which begin in May) as well as summer camps and expenses, etc. Please let anyone you know who is planning on attending Central next year know about this meeting. The Lady Warriors are also being recognized and honored at the City Hall Meeting on Tuesday, May 5th at 3:00 at City Hall. I need everyone to attend this ceremony as well. I think that's all the updates for now. I am going to be doing a lot of improvements to our website starting in May....so check us out. And, I am going to try to post an update everyday, even if there is not much new going on. So please try to get in the habit of checking the site daily and staying abreast of what's going on with the Lady Warriors. Sorry it has been so long since our site has been updated. As you can imagine, it has been extremely busy and very crazy! Most of you know by now that our beloved Lady Warriors lost in the AAA State Championship game on a last second shot at the buzzer. Click here to read that article. It goes without saying how proud everyone is of our ladies! We have a tremendous group of young ladies who are so unselfish and committed to being the best they can possibly be as a team! This has been the greatest group of kids I have ever coached, not because they won 35 games, but because they are fun to be around, they care more about others than they do themselves, and they are willing to sacrifice self-glory for the good of the team. I am very proud of who these ladies are more than what they were able to accomplish. At the end of the 4th sixth weeks, our team GPA was a 3.867! Amazing! The fourth grading period is the most difficult six weeks of the school year for our kids because of our demanding schedule and our demanding teachers. After beating Overton for the City Championship, we went on to win the District Championship, the Regional Championship, and Sub-State. We beat White Station, Houston and Overton in the Regionals and then beat Bartlett in the Sub-State. At the State Tournament, our young ladies beat Tennessee High and McGavock High before falling to Hillsboro High at the buzzer. It was an amazing season with an amazing group of young ladies! The support of the faculty and staff at Central High was absolutely amazing, not to mention the support that grew from the community and fans! The Lady Warriors have gotten their foot in the door of greatness and have every intention of staying there! Before the State Tournament was even over, the kids were having conversations about their efforts in the off-season and how hard they were going to work to improve over the summer. Most of our kids will be playing on some outstanding AAU teams this summer, but all of them will be dedicated to improvement! My kids have heard me say this many times, but I must say it one last time for the record - "I love each and every one of you with all of my heart! I am so very proud of WHO you are and what you have become, as well as what you accomplished this season. Doing it right really does pay off (even though it may take a little more time) and no one can take anything away from this team because of it! Enjoy the next few weeks, compete in spring sports, but do not ever forget the loss of that title game! Let it be a motivator for you to continue to pursue becoming the best you are capable of becoming. I will be bold and say it now - the character and depth of conviction the returning members of this team posess could very well propel next year's team to a second straight title run! No one can do it for you! It will not be easy! Nothing worth having ever is....otherwise everyone would be successful! Each and everyone of you have to make a personal commitment to self-improvement and personal and emotional maturity! It is my belief that if enough of you do commit, you will compete for another State Championship! Click here to read the article about the Semifinal game versus McGavock High School. Click here for a short article. Click here to read the article about the Quarterfinal game versus Tennessee High School. Click here to read another article about the game. Click here to read about Jason Smith's blogging. Click here to read another Jason Smith blog. Click here to read article about Central's lofty goals. Click here to read article about State Pairings. Click here to read article about Bartlett game. Click hereto read article about Overton Regional Championship game. Click here to read article about White Station game. Click here to read article about Houston game. Click here to read article about District Champhionship game. The Lady Warriors move up again in two national polls, ESPN and SCOUT.com. Scout.com ranks the Lady Warriors 21st in the nation, while ESPN moved the ladies from 36 to 29th! The Lady Warriors play 15AAA Champ Overton High School tonight at 7:00pm at Wooddale for the Regional Championship. Good luck ladies!!!! The Lady Warriors (31-1) advance to the Regional Championship game after defeating White Station (26-5) 55-39 last night at Wooddale High School. The Lady Warriors were led by senior point guard, Erica Burgess, with 13 points, including 5 of 7 free throws in the 4th quarter. Freshmen, Aaliyah Whiteside, scored 12 points for the Lady Warriors while freshmen Danielle Ballard added 11 points. Seniors Jamila Ajanaku and Jasmine Taylor had 10 and 9 points respectively. The Lady Warriors play Overton High School Wednesday night for the Regional Championship at 7pm at Wooddale High School. A win will secure home court advantage for the Sub-state game on Saturday. A victory on Saturday punches the Lady Warrior's ticket to Murfreesboro! Congratulations ladies! Keep up the good work and get ready for a dog fight Wednesday night! The Lady Warriors (30-1) defeated the Houston Lady Mustangs 73-54 tonight in the quarterfinals of the Region 8 Tournament at Central High School. Once again the Lady Warriors were led by freshmen Danielle Ballard who added another double-double this season with 19 points and 11 rebounds. Ballard also dished out 4 assists and collected 3 steals while turning the ball over on 3 trips. Senior Jasmine Taylor put in yet another solid night scoring 18 points, grabbing 9 reobunds and 1 steal while defending the University of Arkansas signee Sarah Watkins (6'3"). Senior point guard, Erica Burgess, also played an outstanding game with 10 points, 5 rebounds, 7 assists, 1 steal, and just 1 turnover. Burgess has pushed the ball well for the Lady Warriors all season, but took her ability to race down the floor to another level tonight as Houston desperately tried to get back to the paint to stop her. Senior, Jamila Ajanaku, found her rhythm again scoring 9 points, 2 rebounds, 2 assits, and 2 steals and defending all over the court as well as helping the guards to push tempo. Freshmen, Aaliyah Whiteside, also had a solid night dropping in 9 points along with 2 rebounds, 1 assist, and 1 steal. Junior, Finesse James (a.k.a. "Killer"), came off the bench fired up tonight busting two huge 3 points, chasing down 1 rebound, and collecting 1 steal to add to the balanced attacked by the Lady Warriors. Sophomore, Darianne Butler, also gave huge mintues for senior Jasmine Taylor and put a great move and a score on Arksansa signee Sarah Watkins. Sophomore, Michella Carter, and freshmen, Monia Sanders both gave outstanding effort defensively for the Lady Warriors and on the boards. The Lady Warriors out-rebounded the Lady Mustangs 32-19, holding standout Sarah Watkins to 16 points, 9 reobunds, 1 steal and 7 blocks. The Lady Warriors shot 50% from the floor while Houston shot 42% from the floor. The Lady Warriors shot 57% (8 out of 14)from behind the arc compared to Houston's 21%, making only 3 of 14 attempts. The Lady Warriors did a great job of coming ready to play in tonight's elimination game as Houston struggled to handle Central's intense defensive pressure and uptempo style of play. The Lady Warriors advance to the semifinals of the Region 8 Tournament on Monday night as they play incoming conference opponent White Station High School at 6:00 pm at Wooddale High School. The Lady Warriors have been eliminated from post-season play for the past three years in a row in the semifinals of the Regional Tournament, hopefully this is the year that all changes! Congratulations ladies and you played an outstanding game! 16 AAA DISTRICT TOURNAMENT CHAMPIONS!! Congratulations Lady Warriors on winning the 16AAA District Tournament Championship two seasons in a row!!!! Congratulations are also in order to senior Jasmine Taylor for making All-Tournament Team and being named the Most Valuable Player of the tournament. Freshmen sensation, Aaliyah Whiteside, was also named to the All-Tournament Team and senior Jasmine Green was named to the All-Academic team!! Click here for the girl's Region 8 Tournament bracket and here for the boy's Region 8 Tournament bracket. The Lady Warriors will be playing Melrose tomorrow night (Tuesday) for the 16AAA District Tournament Championship! The Lady Warriors beat Kingsbury in the first round of the district tournament Friday night and Fairley in the semifinals on Saturday night, making their overall record 28-1, to move into the championship round for the second straight season and three out of the last four seasons. Good luck ladies as you have an opportunity to accomplish yet another goal for this season. DO THE BEST YOU CAN DO! I am so proud of what you have accomplished so far this season, but this win was just one of your many goals. So, stay focused on getting better and on doing the absolute best you can and let's have a wonderful time doing it!!!! Great job ladies!! ESPN's Chris Hansen wrote a nice article about our freshmen, Danielle Ballard and Aaliyah Whiteside. Click here to read that article. Although we are fortunate to have two outstanding freshmen whose future is very bright, we do not want to overshadow the contributions of all of our players and managers! I am so proud of each and everyone of our young ladies (and young men), from our outstanding seniors, all of whom are heading to college next school year (3 on athletic scholarships and 1 on an academic scholarship) to our unselfish players who sacrifice their own self-glory so the team can be the star and the outstanding managers who never see their name in the paper! It is the dedication and selflessness of every member of our program that makes Central a great team to coach! Keep up the good work ladies and stay focused on what's important......winning the State! Speaking of post-season play.....the Lady Warriors play Overton High School this Thursday night at White Station at approximately 6:25pm for the City Championship. Then, the Ladies host Kingsbury on Friday night at 6:00pm for the first round of the 16AAA District Tournament. If we win, we will play Saturday night at 6:00pm at Hamilton versus the winner of the Fairly/Hamilton game. Please come out to see the Lady Warriors in action, but if you cannot make it to the game, you can catch them live right here on our website! Congratulations Lady Warriors! Stay hungary! Congratulations Lady Warriors for being District 16 AAA Champions and for achieving your goal of going undefeated in district play with a record of 13-0!!!!! The Lady Warriors moved from 39th to 36th in the ESPN FAB 50 poll. Click here to see the poll. The Lady Warriors, 17-1, travel to Kingsbury tomorrow night. Great job ladies!!!! Keep up the good work! The Lady Warriors defeated the Lady Cougars of Northside 72-40 tonight, the largest win against the longstanding district powerhouse in Coach Bray's four year tenure at Central. The Lady Warriors, now 17-1 (6-0 in District 16AAA), travel to Kingsbury Friday night to round out the first half of conference play. The Lady Warriors move up the ESPN Rise Fab 50 poll this week from #44 to #39th in the country. Click here to see article. Scout.com has ranked the Memphis Central Lady Warrior basketball team #24th in the country! Click here to read the article. Great Job Ladies!!! Keep up the good work and good things will continue to come! But remember.....the target on your back is getting larger and larger! Stay on your toes so we don't have any unnecessary disappointments! I am so proud of you and I love you all so very much! Special thanks to our parents for developing such outstanding young ladies (and young men....Terance and Robert!!!! LOL!) Your Coach!!!! LADY WARRIORS #44 IN THE COUNTRY!!!! Hot off the press......ESPN ranks the Memphis Central Lady Warriors #44 in the RISE FAB 50! Click here to read the article. Great Job Ladies! Remember to God be the glory! Keep working hard, stay hungry and good things will continue to come to our program! Also, the Lady Warriors defeated a tough and fiesty Lady Golden Wildcat team at Melrose High School last night 83-66 to improve their record to 13-1 (2-0 in conference play). The Lady Warriors were led by freshman sensation, Danielle Ballard, who scored 28 points, 19 in the second half (17 in the third quarter). Ballard made five three point shots in the thrid quarter (6 total in the game) to lead the Lady Warriors in their 3rd quarter explosion against the Lady Golden Wildcats. Ballard finished the game with 28 points, 2 rebounds, 5 assists, and 1 steal. Senior, Jasmine Taylor, scored 20 points, had 3 steals, and dished out 2 assists while senior Jamila "Mimi" Ajanaku scored 14 points, grabbed 7 rebounds, 4 assists, and 3 steals. Freshman Aaliyah Whiteside struggled to find her rhythm but managed to drop in 7 points while senior point guard, Erica Burgess, scored 10 points, collected 3 steals, and dished out 7 assists on the night. Every Lady Warrior dressed contributed to the night's success as the Lady Warriors prepare to travel to play the Lady Tigers of Whitehaven Friday night at 6:00 pm. Remember to catch the Lady Warriors in action live on our website by clicking "WATCH LIVE" located on the right hand side of this page. Lady Warriors top in the State! The Lady Warriors are ranked #1 in the State of Tennessee for the first time in Coach Niki Bray's tenure at Memphis Central High School. Click here to see the article. The Lady Warriors travel to Melrose High School tomorrow night to take on the Lady Golden Wildcats at 6:00 pm. If you are unable to make it to the game you can watch it live by clicking on "WATCH LIVE" on the right side of this page. Sorry it has taken so long to upload the site.....it is really busy when you are out of town with a bunch of girls!....especially when they eat so much!!! LOL! Ok...our flight leaves Wednesday morning at 9:45 am (Phoenix-time) and we are scheduled to arrive in Memphis at 1:46 pm. We will be arriving on U.S. Airways and we would like for you to meet us at the baggage claim area if possible. The girls did a fantastic job in Phoenix, winning 2 games and losing 1 game. ESPN covered our game against #12 Whitney Young (Chicago, Ill). To read that article click here. If you are unable to make the game, you can catch all of the Lady Warriors' games live from this site. We had 38 people watch our game online Monday and 29 people watched today. Please share this information with all of your friends and relatives! Parents thank you again for all you do to support the Lady Warriors! The Lady Warriors (11-0) beat the Mountain View LadyToros of Mesa, Arizona 67-53. Memphis Central struggled the first half to find their rhythm and went into the locker room at half time down 26-27. The Lady Toros entered into tonight's game with a record of 8-1 and were led in scoring by Arizona Player of the Year and San Diego State signee Brittany Conger with 23 points. Senior and Arkansas State signee, Jasmine Taylor led the Lady Warriors with 15 points, 13 of which came in the second half. Senior and MTSU signee, Jamila Ajanaku scored 14 points while holding Brittany Conger to just 2 points in the second quarter and eight points the entire second half after Conger exploded with 12 first quarter points. Freshmen Aaliyah Whiteside and Danielle Ballard both scored 14 points while junior Finesse James scored 6 and senior point guard and Southeastern Lousiana signee Erica Burgess added four. The Lady Warriors will play USA Today #17 ranked Whitney Young out of Chicago, Ill at 4:30 Phoenix time (5:30 Memphis time). We had 38 people watching our game live! That was outstanding! Please tell everyone you know to log on and watch the Lady Warriors face off with the #17th team in the country on Monday afternoon. Go Lady Warriors!!!! We made it! We have arrived in Phoenix, AZ safely although we were extremely cramped on the plane! LOL! We have eaten a quick bite at McDonald's and are gonna eat Cici's Pizza tonight before heading to the mall for a couple of hours. We play tomorrow at 3:00 Phoenix time (which is 4:00 Memphis time) and we plan to broadcast our game live on this website (click WATCH LIVE to the right). The resort is amazingly beautiful and the mountains are awesome! Check back later tonight or tomorrow for some photos of the kids and the scenery....it's amazing! Good Morning! This is an update so please read carefully!! First, we are not working out today. We will practice tomorrow from 2:30-4:30. Secondly, our game times for this weekend have changed. We play at 4:00 on Friday and at 7:00 on Saturday night. We play at West Memphis High School in the new gym. If you take the old bridge into Arkansas you will exit to the left onto Broadway. Take Broadway for about 4 or 5 miles at least. The school will be on the right. Go past the school and the gym will be off Broadway on the right. Also, we have only a couple of players who have turned in their money for their under gear. The cost of that gear is $79 per player. Please send that in as soon as possible. Also, please don't forget to send money for food if you are able. This is a huge expense on top of the cost for transportation and the two big tournaments will are participating in this season. Lastly, I have gotten very few Shoot-a-Thon forms and money back. If you have those, please send them in as well. This organization is becoming huge and it really helps when things are done in a timely manner. Thank you so much for all that you do to support our Lady Warriors! One more note: All of the Lady Warrior basketball games are scheduled to be broadcasted live via our website. Please help me get the word out! Please contact family members and friends both near and far. The business that we feed through gives us an update on the number of people who watched the game. The first two games netted over 20 viewers each game! That is wonderful for the first couple of times. We are looking for sponsors to buy commercials so we can run the game at the highest resolution possible. If you know of any businesses that we could contact, please text me their name and number and we will make contact with them. Thanks again! The Lady Warriors (6-0) defeated Bolton High School (2-3) last night 74-43 at Bolton. The Warriors were led by senior Jasmine Taylor and junior Finesse James who scored 15 points apiece. Taylor was 6 of 12 (50%) from the field, 2 of 3 (66%) from the free throw line, gathered 3 steals, and led the Lady Warriors in rebounding with 9 boards. James was 4 of 8 (50%) from the field, including 3 of 5 (60%) from behind the arch, 4 of 4 (100%) from the free throw line, grabbed 2 rebounds and had 3 steals. Freshman Danielle Ballard struggled on offense shooting 5 of 14 (35%) from the field for 12 points and 1 of 4 (25%) from the free throw line. Ballard found other ways to contribute with 3 rebounds, 4 assists, 5 steals and 1 turnover. Freshman Aaliyah Whiteside added 10 points, 4 rebounds, 1 assist, and 1 steal while shooting 4 of 7 (57%) from the field, including 2 of 3 (66%) from the free throw line. Senior Jamila Ajanaku dropped 8 points (all in the first half), 4 rebounds, 3 assists, and 3 steals coming off the bench. Senior point guard, Erica Burgess, added six points, 3 steals, 2 rebounds, and 4 assists. Jalen O'Bannon, Malaika Moore, Michella Carter, and Monia Sanders each chipped in 2 points. Central finished with 18 steals, 17 assists, and 10 turnovers. The Lady Warriors play their first home game Saturday night at 6:00pm versus Fayette-Ware. Season passes will be available for just $30....that's a $10 savings per person! The Nike Tournament of Champions Brackets are now available! Click here to view the tournament brackets. For more information about hotels, dining, etc., visit the Nike website. Attention senior Lady Warriors! There is a $7,500 SAMMY (Scholar Athlete Milk Mustache of the Year) scholarship available for student-athletes who understand the importance of making smart choices, such as drinking lowfat milk and eating a healthy diet. If you would like to apply for this scholarship click here for the link and application form. The Lady Warriors will celebrate Christmas at Coach Bray's house on Monday, December 15th from 6-8 pm. Each Lady Warrior has either a big sister or a little sister. I am asking that big sisters buy a gift for little sisters and little sisters buy a gift for big sisters for the party. We will also be playing the fun game "Dirty Santa" and ask that each player and manager bring a gift of $25 or less for the game. Refreshment requests will be sent home soon! The Lady Warriors play travel Thursday night to Bolton High School. If you cannot make it to see the Lady Warriors in action, you can watch the games live by clicking on the link to the right. The Lady Warriors (5-0) defeated Briarcrest Christian 57-36 to win the championship in the Baymont Inn Thanksgiving Tournament in Cleveland, TN on Sunday. Three Lady Warriors made the All-Tournament Team including Jamila Ajanaku, Jasmine Taylor, and Danielle Ballard. The Lady Warriors were up 37-16 at the half and never looked back holding the Briarcrest Saints to just four points in the third quarter. All players dressed out got playing time as Erica Burgess, Jamila Ajanaku, and Jasmine Taylor sat the fourth quarter. Jasmine Taylor led the Lady Warriors in scoring with 13 points and 6 rebounds while Jamila Ajanaku 10 points and 7 rebounds, and 3 steals. Senior point guard, Erica Burgess, came back from a game-ending ankle injury a day before to score 9 points, grab 4 rebounds and dish out 4 assists and 2 steals in limited minutes. Freshmen Aaliyah Whiteside added 8 points and 2 steals while junior Finesse James dropped in 7 points, including two three point baskets. Freshmen Danielle Ballard has six points, 9 rebounds, 2 assists, and 3 steals on the night. Sophomore Michella Carter chipped in 3 points and 2 rebounds as freshmen point guard, Jalen O'Bannon, added one point from the free throw line. The Lady Warriors travel to Bolton High School Thursday to play the Lady Wildcats at 6:00 pm. Congratulations Lady Warriors! Keep up the good work! We love U!!!! The Lady Warriors (4-0) upset the 2007-2008 defending Class AAA State Champs, Wilson Central (3-1), tonight 60-47 in the semifinals of the Baymont Inn Thanksgiving Tournament in Cleveland, TN. The Lady Warriors had four players in double figures including seniors Jasmine Taylor and Jamila Ajanaku with 12 apiece, junior Finesse James 11, and freshmen Danielle Ballard with 10 points. The win was a complete team effort with senior point guard Erica Burgess suffering a game-ending ankle sprain late in the first quarter. It only got worse! Seniors Jamila Ajanaku and Jasmine Taylor both found themselves in foul trouble and had to sit long stretches throughout the remainder of the game. Freshmen guards Aaliyah Whiteside and Danielle Ballard picked up the ball handling responsibilities with poise and confidence! Sophomore Darianne Butler came off the bench and did an outstanding job protecting the paint, rebounding, and adding a couple of baskets with some outstanding offensive moves as Wilson Central settled in to a zone defense. The Lady Warriors forced Wilson Central out of the zone scoring 20 points out of their delay game in the fourth quarter as junior Finesse James hit three 3-point shots to seal the win!!! Aalyiah Whiteside played a strong second half after sitting most of the first half in foul trouble scoring 9 points. Jamila Ajanaku and Danielle Ballard led the Lady Warriors in rebounding with seven rebounds apiece while Darianne Bulter grabbed four more. Wilson Central was without their All-American center and Georgia signee, Jasmine Hassell, who was out with a back injury. The Lady Warriors play Briarcrest Christian tomorrow at 4:30 Eastern time for the Baymont Inn Thanksgiving Tournament Championship. Good luck ladies and GO WARRIORS GO!!!!!! The Lady Warriors are 3-0!!!!!! The Lady Warriors ran the Lady Panthers of Brainerd High School (0-1) clear out of the gym with a 67-45 victory. Freshmen sensation, Danielle Ballard, scored a season-high 29 points to lead the Lady Warriors, shooting 11-13 from the field and 6-7 from behind the arc. Junior Malaika Moore was the second leading scorer with 8 points and 3 rebounds followed by senior Jasmine Taylor's seven points four rebounds. Seniors Jamila Ajanaku and Erica Burgess each added six points while freshmen, Aaliyah Whiteside chipped in three. Sophomores LaShea Shaw, Michella Carter and Rheunna Gillespie along with junior Finesse James each scored two apiece. The Lady Warriors cleared the bench as every player saw playing time in a complete team victory over the Lady Panthers. Antronetia Ivey led the Lady Panthers with 15 points and 5 rebounds while Tyresha King added 14 and 8 rebounds. The Lady Warriors face 2007-2008 State Champs Wilson Central tomorrow at 3:30 Central time. Contragulations Lady Warriors! Take down the Lady Wildcats tomorrow afternoon!!!! Good Morning! I know it has been a while since I updated our site, but it has been crazy busy! I wanted to update everyone on our trip this weekend to Cleveland, TN but first I have a very important announcement.........CONGRATULATIONS goes out to Finesse James for being inducted into the National Honor Society on this wonderful day! Great job Finesse!.......another Lady Warrior achieving excellence in the classroom! We are very proud of you Nessy!!!!! Back to this holiday weekend....we will practice tomorrow (Wednesday) from 8-10:30am and the bus will leave Thursday (Thanksgiving Day) at 3:00pm. Please plan to arrive between 2:30 and 2:45 because the bus will be leaving at 3:00pm. We will stop in Murfreesboro, TN to eat at the Cracker Barrel for dinner. I have uploaded a copy of the bracket to our website and you can download a copy by clicking on 2008-2009 then looking on the left side of the page for the Thanksgiving Tournament link. All expenses are covered for this trip, but you might want to send some spending money for snacks or maybe a tournament t-shirt. I hope all of our parents will be able to make the trip to Cleveland, but if you are not able, I will try hard to post the score and some information about the game each night. We will be staying in the Baymont Inn in Cleveland, TN and the number to the hotel is (423) 339-1000. Happy Thanksgiving to all and hopefully we will bring home our first championship of the season Sunday night. Once we make it to Jackson, TN we will ask all players to begin calling home so parents can make arrangements to be waiting on us when we pull up. Hopefully we will be wonderfully exhausted carrying the championship trophy back to Memphis! Wish us luck and GO LADY WARRIORS!!!!! WOW!!!!!!! What a great couple of days! Tuesday night's fundraiser was a HUGE success! It was great to see so many people out to support our Lady Warriors! We are still waiting for all the pledges to come in.....parents if you have any pledges to collect, please send them to school when you get a chance. Yesterday was absolutely overwhelming and joyful! Three Lady Warriors signed Division I scholarships to play college basketball! Erica Burgess signed a National Letter of Intent to play at Southeastern Louisana. Jasmine Taylor signed a National Letter of Intent to play at Arkansas State University and Jamila "Mimi" Ajanaku signed a National Letter of Intent to play at Middle Tennessee State University for the legendary Rick Insell. The support, once again, was amazing and the food and cakes were awesome! Thanks to everyone who was able to come out and witness the 7th, 8th, and 9th Lady Warriors to sign a full athletic scholarship since 2005!!!! Special thanks goes out to Mrs. O'Bannon (Jalen's Mom), Mrs. Moore(Malaika's Mom), Mrs. Janet Askew (Former Booster Club President), and Ms. Christy (Mimi's Aunt) for setting up and serving the refreshments! Thanks also goes out to all of the faculty, staff, and Administration for their continued support of Lady Warrior Basketball! We are so grateful for your constant pushing of our student-athletes in the classroom and for never allowing them to settle for less than their best! Thank you so much!!!!!!! Click on the links below to see some of the pictures from the Signing Ceremony on yesterday. We will be having our 1st Annual Shoot-A-Thon fund raiser tonight from 6-8 pm. Please invite and encourage all of your sponsors to come and enjoy fish and chips with our wonderful kids! Thank you, parents, for all of your hard work and dedication to our program......our children deserve every ounce of it! I think we have quite a bit of fish (and we bought a box of chicken, too) and fries to feed around 100 people. There are a few things we may need...if anyone is able to help with some condiments (such as tartar sauce, ketchup, mustard, honey mustard, hot sauce, etc. ), napkins, plates, and plastic utensils. Also, we are having our National Signing Day Ceremony tomorrow at 1:00 pm in the gymnasium. I truly hope everyone can make it out to this joyous event! If you are unable to attend, please try to send some refreshments if possible. Thank you again for everything! I know it seems like a lot, and it is, but this is the price we must pay to develop and maintain a great program! Please note that there will be a lot going on in the building that day as the school prepares for our "Going Green" Exhibition Day, which will be Thursday. The varsity will be leaving for Shelbyville tomorrow after 4th period. We play four games on Saturday. You can view the schedule by clicking here . Players are only allowed one bag plus their sleeping bag, pillow, and blanket. Space is very limited!!! Please make sure your child has money for food. We will be back Saturday night and we will have players call you when we are in Jackson, TN....that will give you about an hour to arrive at the school. Please be there waiting on us if anyway possible.....we will be exhausted!! Also, I need some input on how many people may show up for our event next Tuesday night. Please email or text me the number of people you expect. I realize they may or may not show up but we are trying to make sure we have enough food without having way too much! I have created an invitation for our fish fry. If you would like to download a copy to give out to your sponsors click FISH FRY INVITATION. Season passes will be on sale during our Hall of Fame Classic. We have 8 home games this season and season passes sell for $30. We will take a check or you can pay with cash. Season passes will save you $10 per person for the season! Thanks so much and I look forward to a great fundraising event next Tuesday! Last but not least.....please, please, please don't forget that we have three seniors who are signing next Wednesday at 1:00 in the gym. Mrs. Burgess has sent out some information about what items are needed. I hope you are able to make this wonderful ceremony! All three of these young ladies are signing full scholarships to play Division I basketball!!! If for some reason you are unable to make the signing ceremony, please try to send some refreshments. Please check with Mrs. Burgess for more information about what is needed! Thank you so much for allowing this coaching staff the honor to teach, work with, and coach your child!!! If anyone has Shoot-a-Thon forms ready, I need a copy so we can mail invitations to your sponsors. Please send a copy of the Shoot-a-Thon form to school by tomorrow, Tuesday, November 04, 2008 in order for us to have time to get them mailed out. Also, we are in need of fish for our fish fry. If anyone can help us get fish donated for the event that would be great! Remember, we will begin shooting the freethrows at 6:00 on Tuesday, November 11, 2008. We will have one last road block on Saturday, November 15, 2008 at the corner of Poplar and Highland from 9:00 am to 3:00 pm. We need everyone present from 9-3pm and we need everyone to bring money for their lunch. Click here for the Tournament Bracket for the Thanksgiving tournament. We now have the schedule for the Shelbyville Play Day. Click here to download the schedule now. Check out the photos from last night's photo session! Click the link below!!!! We have had two great days of practice. We still have a lot of issues to work through, such as practice gear for the freshmen team and getting newcomers shoes, but everything has been fantastic! I have never had such outstanding leadership as our seniors and upperclassmen have shown in our first couple of practices. We have team and individual photos today. Hopefully the ladies will remember to bring a nice outfit for their casual photo. We will practice after pictures, but will be finished between 7:30 and 8:00. This will mean three late days in a row, but we will be fine. Our outstanding parents have decided to do another road block this Saturday at the corner of Poplar and Highland. Mimi Ajanaku is the leader of this event. Your athlete needs to check with her for the time slot they need to attend. Practice will be pushed back due to this fund raiser. Varsity will practice from 3-5 pm and the freshmen will practice from 5-7. We will be off Sundays (we will rarely have any workouts on Sundays once practice has begun). Freshmen will practice Thursday from 5-7:30 pm. Please pack your child a snack on Tuesdays and Thursday because it is such a long day. They have mandatory study hall from 2:30-4:00. They will have about 30 minutes to get a small bite to eat. Please check this site daily as I will try hard to keep parents, players, and supporters up to date on Lady Warrior basketball. One last thing.....please keep working on the Shoot-A-Thon and let me know if you have time to call around to some of the local businesses about donating fish for our event. If there is anyone who could help me with this, I would be very grateful. Thank you for allowing me the honor of working with such wonderful kids! I hope all of the parents got the t-shirts I sent home....if not, check with your child - they tried to keep it!!! Wear your Lady Warrior gear with great pride.....your kids are awesome!!! Today is the first day of practice! Wow! I thought this day would never come!!!! We will be done with practice today between 4:45-5:00 pm. Just wanted to remind parents about the Shoot-a-Thon fund raiser. We really need this fundraiser to be a HUGE success! Please try to get as many sponsors as possible and please invite them to come on Tuesday, November 11th at 6:00pm. Please send your Shoot-a-Thon sponsor forms back to school by Tuesday, November 4th so we can mail them an official invitation to the event. If you want to continue to collect sponsors, please feel free to download another form and bring it to the event. We are hoping each player will have a parent or family member in attendance the night of the event to rebound and encourage them. If a parent cannot be present, we will have someone fill in for you. If there is anyone who knows of someone who could donate some fish for the event please let me know! First Sargent Green, with our ROTC program, has volunteered to cook the fish. I am looking forward to a wonderful night of food and fun with our families and friends. I hope you will be able to join us if you can! Thanks! Thank you for your attendance at last night's parent meeting. I know some of you were unable to make it last night so I am going to provide information about the meeting. First let me welcome our new families to the program! We are very excited about having you apart of our program!!! I want to introduce my staff to you. The first assistant coach I want to introduce is Brady Benjamin. His primary responsiblity is working with the guards. Coach Ben (as he is affectionately known) is in his second year with the program. He is also Central High School's head baseball coach. The next assistant coach I would like to introduce is Kelly Fields. Coach Fields has been with the program for three years now. She carries a wide range of responsibilities that include player academics, fundrasing, and book keeping. Coach Fields also assists with the Freshmen team. Another assistant coach on the Lady Warrior Basketball staff is Coach John Dawson. Coach Dawson is new to the Lady Warrior coaching staff this season. Coach Dawson brings a wealth of knowledge to our staff as he has coached numerous AAU teams as well as Homeschool teams for many years. He will be working primarily with our post players. Our newest addition to the Lady Warrior Basketball staff is Ms. Crystal Williams. She will be our head coach for the freshmen team. Crystal played for me when I was the coach at Wooddale High School. She is very dedicated and committed to working with children. Coach Williams will be graduating from the University of Memphis in December with her degree in Physical Education. Congratulations Coach Williams!!!! We will practice from 2:30-4:30 on Mondays, Wednesdays, and Fridays. We will go to study hall on Tuesdays and Thursdays from 2:30-4:14 and practice from 5:00-7:30 or 8:00pm. Our varsity, freshmen, and Hall of Champions schedules are located on our website. Please download as many copies as you need. Central will be going back to Shelbyville High School again this year for their annual Play Day. We will leave immediately following school on Friday, November 7th and will return Saturday night, November 8th after our last game. I will post that schedule when we receive it. Players need to bring money for food only. We will sleep in Shelbyville High School's gym and will travel in coaches vehicles. Central will also be returning to Cleveland, TN this Thanksgiving to play in Bradley Central's Holiday Invitational. Brackets will be posted as soon as we receive them. We will take a charter bus to Cleveland and will leave Central High School on Thursday, November 27th at 3:00 pm. We will be staying in the Baymont Inn in case parents get a chance to come up. We have also been invited to play in the prestigious NIKE Tournament of Champions in Phoenix, AZ December 26-31, 2008. We will fly U.S. Airways flight # 2836 leaving Memphis at 7:45 am and arriving to Phoenix at 10:20 am. All players need to report to the airport by 6:00 am on the morning of December 26th. We will return on December 31st on flight # 2934 departing Phoenix at 9:45 am and arriving in Memphis at 1:46 pm. Please make arrangements to pick your child up on December 26th from the airport. All expenses will be covered by our fundraising efforts but your child may need a little money for snacks or memoribilia sold at the tournament. We are asking parents to allow their child to pack only one piece of luggage for this trip. In their NIKE carry on bag, they will be required to pack both uniforms, their shoes and one change of clothes just in case their luggage is lost. Parents are being asked to pay for the luggage fee which is $15 for the first bag (up to 50lbs) and $25 for the second bag (up to 50lbs). Remember, we are asking that players be allowed to pack only one bag for this trip. We will be staying in the AAA Grand Resort while in Phoenix. Players will need to pack a swim suit if they want to enjoy the resorts water park (the first day only). I will post the brackets as soon as we get them as well! The only expense we are asking parents to help pay for is the NIKE under gear. The cost of the under gear is $78 total and includes a white tight, a green tight, white compression shorts and a sports bra. Players will not be allowed to receive their gear until it has been paid for. We feed our players before every game, home and away. Mr. Lewis Bobo, owner of the Gay Hawk Resturant, caters one meat, two veggies, homemade dessert, usually a salad, and cool-aid and sweet tea for $8 a person. He brings the food, sets it up, cleans it up, and takes it back to the restuarant himself. He takes very good care of our children and allows them to set the menu for the next meal. Due to the expenses of our out-of-town tournaments, we are asking parents to try to help us with this expense. If possible, we are asking each parent to pay $40 each of the following months to help us cover the cost of food (October, November, December, January, and February). The player and I will have to continue to fund raise to cover whatever expenses remain for the food. So, if you can help, even a little, that is just a little less we have to raise. This is not mandatory....we are going to feed the children regardless, but we are asking for your help. I handed out a copy of the MIAA Handbook at the meeting last night. Please click on the link to download this handbook. This is a great tool for parents and athletes. It is a great resource to keep you knowledgeable about MIAA rules, TSSAA rules, NCAA rules and other college entrance information. One point of emphasis is the Parent and Student-Athlete Code of Conduct. Please read and sign this form and return it to me. This form is required in the team notebook and all players must have this form on file in order to practice or play. Our expectations are very simple - DO THE RIGHT THING! We understand that our children are still growing and developing so we do not believe in having a lot of rules and consequences. Instead, we want to work with each child indivdually and try to help them learn and grow from their mistakes and choosing punishments that are appropriate for each individual player. We expect our players to be leaders in the classroom, in the community, and on the court. It takes a special player to be a student-athlete due to the amount of work and responsibility required to be successful at both. Academics are extremely important at Central High School. All student-athletes are expected to excell in the classroom and to take their education seriously. Our players are not allowed to make C's on their progress report or report card nor are they allowed, under any circumstance, to earn an N or U in conduct. We will have study hall for every player on Tuesdays and Thursdays from 2:30-4:15. Study hall is mandatory as we emphasize the importance of proper study habits and a great education. Any student who falls behind in the classroom could be required to do more study hall hours, be suspended, or even be dismissed from the team. I would like to encourage all parents and athletes to monitor their grades closely through the use of our online gradebook, teacherease.com. Through teacherease, students and parents have 24 hour/7 days a week access to their grades, behavior logs, assignments, and attendance. Educators are busier than ever with paperwork and making mistakes are easy to do. It is your grade and your responsibility to monitor it throughout the six weeks! We will take our team and individual photos on Wednesday, October 28th at 5:00 pm. Each player needs to bring a nice casual outfit that I would deem appropriate (something nice enough to wear to church or to a special occassion). Parents, we are asking you to take charge of this fundraiser. We are trying to get at least 20 people or businesses to sponsor a player in the shoot-a-thon. Sponsors would make a pledge per free throw made out of 100 shot attempts. We are asking that the forms be turned in by Tuesday, November 4, 2008 because we want to send invitations to each sponsor to attend the Shoot-A-Thon event and enjoy a free fish fry. Please encourage everyone who makes a contribution to attend this event. It starts at 6:00 pm on Tuesday, November 11, 2008. Players will need a parent or family member present at the event to rebound for them and a one of our coaches will record the shots. We really need to get behind this fundraiser and push it hard. We can really make a large amount of money and build great community support at the same time. Please feel free to show the sponsors of your child around the school and our locker room. Click here if you need another Shoot-A-Thon form. This is becoming a great tradition for the Central High School Lady Warrior Basketball program! This is my fourth season as the head coach of this great program and this is the fourth National Signing Day event we have had the honor to organize. This year we have three Lady Warriors who will be signing a National Letter of Intent to attend a Division I college on a full athletic scholarship. Senior point guard, Erica Burgess, will be signing with the Lady Lions of Southeastern Louisana. Senior guard, Jasmine Taylor, will be signing with the Lady Red Wolves of Arkansas State University. And last, but not least, senior guard/forward, Jamila Ajanaku, will be signing a National Letter of Intent to play for the Lady Blue Raiders of Middle Tennessee State University. This event will take place on Wednesday, November 12th at 1:00 in the school gymnasium. We are asking all of our parents to try to make arragements to be in attendance for this wonderful event and to each bring a refreshment such as soda, cake, sandwhiches, etc. We are very proud of our seniors and want to show them how much we love them. This event is open to the public as we welcome all of our Lady Warrior Basketball supporters and alumni!! Our Booster Club is working very hard to help us raise needed funds for our trip to Phoenix, AZ. To get on the email list, please email your contact information to nikibray@coachbray.net and we will get you in the know with what is going on with Lady Warrior Basketball. Currently, our parents are trying to organize a Lock-In for first through six graders on October 31, 2008 in the school gymnasium. Our players are going to play games, tell ghost stories, etc. with the kids. Members of our Student Council will be participating as well as members of the school art club - they will be doing face painting. We are trying to help give parents a safe place to bring their children for a few hours of Ghostly Fun! Tickets are just $10 per child and parents are welcomed to stay. Please help us get the word out to all your nieces, nephews and cousins. Our Booster Club has also organized a RoadBlock to be held this Saturday, October 26, 2008, from 9am-3pm at the corner of Highland and Poplar. We need all Lady Warriors present at this event!....and prayers that this event will be a blessing and the community will donate generously. Please check this site regularly for updates! 1. Sponsor a player per shot made (shooting 100 free throws). Thanks so much for supporting the Lady Warriors! Freshmen and varsity schedules are up!!!! Central will also be hosting its 1st Annual Hall of Champions Classic this season. Please download a copy of that schedule too! We have some great teams participating in the Hall of Champions so spread the word! We will have open gym this Sunday night from 4-8pm. Players can shoot on the gun from 4-6 and run games from 6-8pm. Also, we will have practice next Monday (June 2nd) and Tuesday (June 3rd) from 12-2pm. All players need to bring their $50 for camp as well as their signed team camp form. If you need another copy of the brochure, click here. Also, remember we will be leaving at 7:00 am on Wednesday morning June 4th from Central High School's Bellevue parking lot. Please plan to arrive between 6:30 and 6:45 am. Thank you!! Go Lady Warriors! All Lady Warrior basketball players have been given 20 Pancake Breakfast tickets to sell for the June 7th event @ Applebees. The tickets sell for $5.00 each. All money should be turned in the morning of the event or sooner. Thanks! Due to the Memorial Day Holiday, we will not practice on Monday of next week and we will not have open gym this Sunday night. Due to the Boy's Basketball Spring League starting at 3:00 pm each day next week, practice will have to be moved to 12:00-2:00 pm instead of 6:00-8:00 pm next Tuesday and Thursday. I will let you know what time practice will be for June 2nd and 3rd next week. Thanks!! their own meals and should need around $60 for food. another copy of the brochure, click here. Senior, Clantina Stewart, signed a National Letter of Intent with Middle Tennessee State University April 16, 2008 at 1:00pm. Congratulations to Tina and her family for this outstanding achievement!